"These are unverifiable 'just-so stories." In his 1863 book Evidence as to Man’s Place in Nature, Thomas Henry Huxley raised hell by arguing that humans weren’t special. Like other animals, he said, humans are a byproduct of evolution, which means that we and apes share a common ancestor. This, of course, upset the religious set who believed that humans were designed by a higher power. Today, that religiosity isn’t as fervent, but we’re still obsessed with the idea that humans are unique among animals — and as researchers argue in a new Frontiers in Ecology and Evolution paper, we’re getting biology wrong because of it. Our obsession with human singularity continues today, Howard University anatomist Rui Diogo, Ph.D. argues in the new paper, even among those who research and fully support evolution. The consequences of this is bad science: Diogo and his colleagues, illustrating this point, revisited muscles thought to be “uniquely human” in the bodies and faces of several ape species, only to find that they actually do exist in our evolutionary relatives. For a long time, scientists took it for granted that these muscles only existed because they put humans at an evolutionary advantage. The similarity in head muscles between chimps, bonobos, and humans. Diogo, along with his colleague Bernard Wood, Ph.D., a professor of human origins at George Washington University, performed the analysis by combing through previous literature on ape anatomy and dissecting bonobo specimens that had died from natural causes. 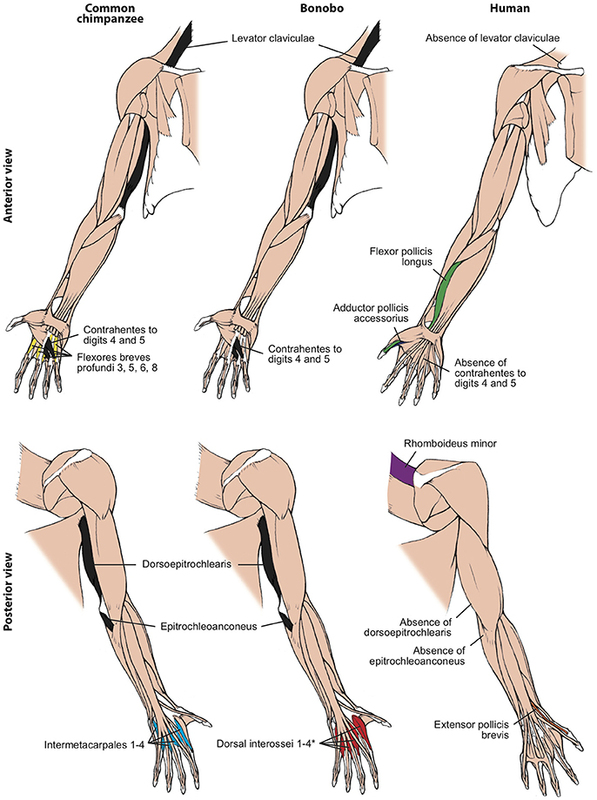 Differences between forelimb muscles of chimps, bonobos, and humans highlight in color. The laryngeal muscle arytenoideus obliquus and the risorius in the face, both also thought to be uniquely human, are also present in chimpanzees and gorillas. The oblique arytenoids are bilateral muscles within the larynx, the hollow muscular organ that holds the vocal chords, and the risorius is a facial muscle along the jaw (highlighted in red below). Previously, these muscles were thought to have evolved to provide humans with our sophisticated vocal and facial communication skills. It turns out that’s not completely true, either. The risorius is a muscle of facial expression. These findings, Diogo argues, are evidence that the origin and evolution of human soft tissue is more complex — and less exceptional — than scientists have realized. Importantly, it contradicts the “progressionist narrative about our ‘special’ place in nature.” Humans are obviously different in some ways from our ape relatives, but we’re far more alike that some might want to believe. But the truth is, humans are animals, and we’re tightly linked to our hairy, partially-bipedal kin, whether we like it or not.